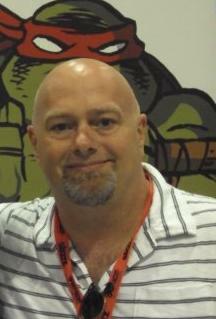 Lavigne inked the backup story in the 1989 collected Tales of the Teenage Mutant Ninja Turtles. Lavigne was a participant in the drafting of the Creators’ Bill of Rights. He is also the basis for the character of Michealangelo, one of the Teenage Mutant Ninja Turtles, according to TMNT co-creator Kevin Eastman. He currently lives in Wells, Maine with wife Denise and children Cooper, Gracie and Jackson. Steve currently works as a freelance illustrator and does occasional work for Mirage Studios. In July 2007, he also released a self published book Shine Like A Lighthouse, written by Tim Janis, illustrated by Steve. You should update this to include that Steve now owns & operates “Shellback Artworks” in Wells, Me, minutes from the Wells exit of the Maine Turnpike. Comics store on the main level/first floor, artist studio/classroom downstairs and studio/gallery up on the second floor! Check out my two blog posts about my couple recent visits!